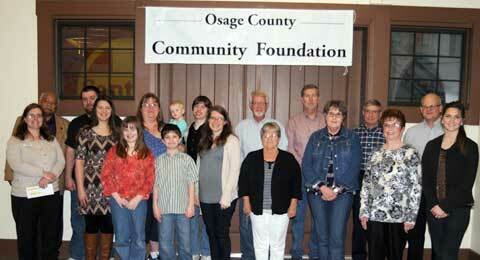 Grant recipients and foundation board members gathered last week for winter grant distributions. 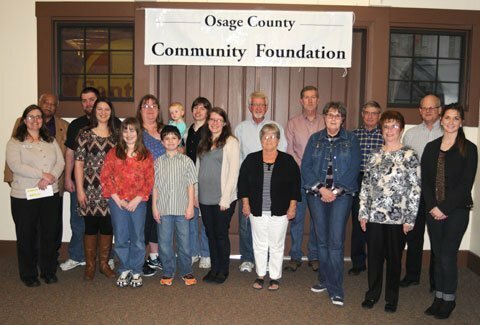 The Osage County Community Foundation distributed its winter grants on Feb. 23, 2017, benefitting a variety of Osage County organizations’ projects and programs. The community foundation makes grants of up to $1,000 to local organizations for innovative and creative projects and programs in the areas of health, social service, education, recreation and cultural affairs. The recipients of this round of grants were announced during a reception held Thursday at the Osage City Santa Fe Depot. Foundation chairman Perry Thompson announced the recipients, noting the foundation had eight applicants and funded five requests. He said the eight applications represented the most received during any of the foundation’s grant rounds since its beginning in 2002. 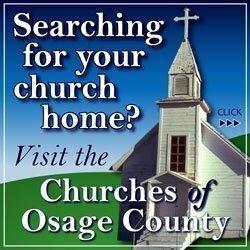 The Osage City Chamber of Commerce – The Chamber helps create recognition for Osage County and Osage City, and the foundation’s grant of $350 will go towards the Chamber setting up a booth at the Kansas Sampler Festival, in Winfield, Kan., May 6 and 7, 2017. 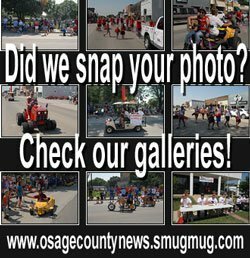 For several years, Chamber volunteers have represented Osage City and Osage County at the festival, which has had as many as 12,000 people attend. This year is the last time the event is scheduled. Ecumenical Christian Action Team (ECAT) – ECAT sponsors the Osage City clothing and food pantry at 306 S. Martin St., Osage City. ECAT provides emergency food and clothing, furniture and small household items, and other donated items during the holidays. The organization requires a safe and dry place to store items and recently the ceiling in that area has fallen in. Repairs for the ceiling are estimated at $1,200, and the foundation presented a check for $750 to be used toward the ceiling repairs. East Central Kansas Economic Opportunity Corporation (ECKAN) – ECKAN has identified a gap in Osage County for students attending school to have appropriate athletic shoes. ECKAN has formed a partnership with Payless Shoe Source, Topeka, to provide discounted gift card rates, if the cards are purchased in bulk. ECKAN had funds last year to provide 85 children with the gift cards, but those funds are not available again this year. The foundation presented $1,000 to help with ECKAN’s shoe project. Burlingame Community Library – Burlingame Community Library is reorganizing its space to create a young adult room for kids to come in after school. The library currently has one unused space being remodeled at an estimated cost of $2,894. By creating this new space for the kids it will also create more room for the adult library patrons. Noting the library continues to grow patronage and services, the foundation provided $500 towards the remodeling project. Osage City Parks and Recreation – Osage City Parks and Recreation’s gymnastics group began in 2016, and is instructed by Danielle Hallgren. The initial sign up was 40 students. OCPR has mats that can be used for the program, but needs more due to the increased interest. This program will help students with balance and coordination, as well keeping them involved with physical fitness and social interaction. The grant request was for $1,000, but it was noted the mats will likely cost less than that, and the foundation will fund the cost of the mats when the amount is known. Thompson told those gathered at the awards reception the foundation was started in 2002 with $500, and due to some generous donors it now holds assets of over $1 million. Awards from the foundation’s general fund represents funds that have been donated with no restrictions, and can be used as the board desires. The foundation also has donor advised or designated funds, from which the donor may decide what the grants will fund. Designated funds have been directed to where and when those donations will be distributed. Thompson said that donations don’t have to be in cash, noting the recent donation of a car (2007 Chevrolet Impala) that is now for sale, with proceeds from its sale to go to the foundation. He noted the next grant application deadline is March 31, 2017, and encouraged local organizations to apply. 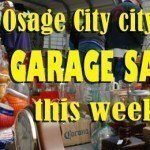 For more information about the car or the Osage County Community Foundation, contact Thompson at 785-528-3006, or Osage Capital LLC, 115 N. Fourth St., Osage City.